The Basidiomycota is the sister group of the Ascomycota. The tree shown above is based on Swann and Taylor’s (1993) analysis of nuclear small subunit ribosomal DNA sequences. Figure 1. SEM of the surface of a mushroom gill (Coprinus cinereus: Hymenomycetes) showing several basidia, some with four basidiospores attached. Ballistospory is associated with the production of a liquid filled "hilar droplet" that forms at the base of the spore, just above its attachment to the sterigma (Fig. 2). Resolving the mechanism of ballistospory has been a longstanding problem in mycology (Buller 1909, 1922; Ingold 1939; McLaughlin et al. 1985; Webster et al. 1984a, b; Yoon and McLaughlin 1986). In a series of studies, reviewed by Money (1998), it has been shown that spore discharge occurs when the hilar droplet fuses with a film of liquid on the surface of the spore. The rapid coalescence of the liquids causes a sudden shift in the center of mass of the spore and contributes to its release from the sterigma. This mechanism has been termed a "surface tension catapult" and it results in spores being discharged with a force of about 25,000 g (Money 1998). Figure 2. Scanning electron micrograph showing the hilar droplet at the base of a basidiospore (Coprinus cinereus: Hymenomycetes). 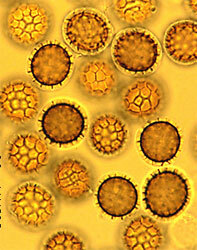 Basidiospores germinate to form hyphae (filaments) or yeast cells that are typically haploid and uninucleate. The hyphae of Basidiomycota are septate. Ultrastructural features of the septa, visible with transmission electron microscopy, have been important in developing phylogenetic hypotheses in Basidiomycota (see Hymenomycetes page). There is strong evidence that the Basidiomycota is monophyletic. Ballistospores, basidia, and clamp connections are present in each of its major subgroups (although not in all species), suggesting a common origin. Non-molecular characters that have been used to recognize major groups within the Basidiomycota include the form of the basidia (shape and septation), ultrastructure of hyphal septa and spindle pole bodies, presence or absence of yeast phases and "spore repetition" (production of spores directly from spores), and cellular carbohydrate composition (McLaughlin et al. 1995; Oberwinkler, 1987; Prillinger et al. 1990, 1991). Sequences of ribosomal genes (rDNA) have played a major role in increasing our understanding of the relationships within Basidiomycota, and have demonstrated that some previously emphasized morphological attributes, such as the form of basidia, are subject to homoplasy (Swann and Taylor 1993, 1995; Swann et al. 1999). Three major groups are recognized within the Basidiomycota: 1) Urediniomycetes includes rusts (Uredinales) and other taxa (Swann et al. 2001); 2) Ustilaginomycetes includes smuts (Ustilaginales) and others (Bauer et al. 2001); and 3) Hymenomycetes includes mushrooms (Homobasidiomycetes), jelly fungi (Auriculariales, Dacrymycetales, Tremellales) and others (Hibbett and Thorn 2001, Swann and Taylor 1995, Wells and Bandoni 2001). Monophyly of each of these groups has been strongly to moderately supported in phylogenetic analyses of rDNA sequences, especially nuclear small subunit rDNA (Swann and Taylor, 1993, 1995; Swann et al. 1999). Analyses of nuclear large subunit rDNA sequences have provided only weak support for monophyly of the Ustilaginales, however (Bauer et al. 2001). The pattern of relationships among the Urediniomycetes, Ustilaginomycetes, and Hymenomycetes are not well resolved by rDNA sequences. Similarities in the ultrastructure of septal pores and spindle pole bodies (McLaughlin et al. 1995) suggest that Ustilaginales and Hymenomycetes could be sister groups, but not all rDNA phylogenies show this topology. Additional data from multiple genes are probably needed to resolve the deepest divergences in the Basidiomycota. McLaughlin, D.J., Frieders, E.M. and L?, Haisheng. 1995. A microscopist's view of heterobasidiomycete phylogeny. Stud. Mycol. 38: 91-109. Oberwinkler, F. 1977. Das neue System der Basidiomyceten. In: Beitr?ge zur Biologie der niederen Pflanzen. Frey, H., Hurka, H., Oberwinkler, F. (eds.) G. Fischer, Stuttgart. Prillinger, H. D?rfler, C. Laaser, G. and Hauska, G. 1990. A contribution to the systematics and evolution of higher fungi: yeast-types in the basidiomycetes. Part III: Ustilago-type. Z. Mycol. 56: 251-278. Prillinger, H., Laaser, G., D?rfler, C. and Ziegler, K. 1991. A contribution to the systematics and evolution of higher fungi: yeast-types in the basidiomycetes. Part IV: Dacrymyces-type, Tremella-type. Sydowia 43: 170-218. 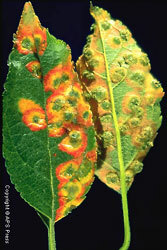 Spore producing structures of the cedar-apple rust fungus (Urediniomycetes) on an apple leaf.